(RRP £289.99). A classy and elegant leather pencil skirt in a superior soft smooth semi-aniline nappa leather. The leather has a special waxed finish which gives a subtle shading effect. It is knee-length and beautifully tailored for a shapely flattering fit. It is styled with two side slant pockets and a rear vent. Fully lined. We also have larger sizes for the fuller figure. Exclusive to Tout Ensemble by Ashwood. A matching waistcoat is also available to wear as an outfit. Available in black, cognac tan and cherry red. Please see our Product Description below for full details and important sizing information. (R.R.P £259.99). Beautiful quality and most elegant - a black leather midi pencil skirt, exquisitely tailored in luxury soft lambskin nappa leather, sourced from British hides. The skirt is styled with a smooth clean line and for a figure-hugging fit - just perfect for smart or smart/casual wear. The skirt also has a kick pleat at the back that adds style and is fully lined in beautiful red satin fabric. Length (from waist to hem): 27in/68cm. It fastens with an attractive golden metal zip at the rear. Made by Ashwood exclusively for the Tout Ensemble label by Ashwood to our own design. Please see our Product Description below for full details and important sizing information. NOTE: This same style with a kick pleat is available in other lengths - Knee Length: 23in; Midi: 31in and Maxi: 36in (click on links to see each one). (R.R.P £279.99). A most elegant black leather midi skirt with a smooth clean line, in a mid-calf/above-ankle length. Just perfect for smart/casual or more formal wear. It is exquisitely tailored in finest quality super soft lambskin nappa leather, sourced from British hides and is styled as a figure-hugging pencil skirt to emphasise the natural curvature of the body. Length (from waist to hem): 31-32in/79-82cm, depending on size. At the back, it features a short kick pleat for added style and to ease movement plus a short attractive gold-coloured metal zip fastener. It is fully lined in beautiful red satin fabric. Made exclusively for the Tout Ensemble label by Ashwood to our own design. Please see our Product Description below for full details and important sizing information. NOTE: This same style with a kick pleat is available in other lengths - Knee Length: 23in; Midi: 27in and Maxi: 36in (click on links to see each one). (R.R.P £239.99). A fine quality classic! A most elegant knee-length leather pencil skirt with a smooth clean line and a short kick pleat at the back. Just perfect for smart or smart/casual wear. So versatile and easy to wear with a whole range of tops, sweaters and shirts. Exquisitely tailored in luxury soft smooth lambskin nappa leather, sourced from British hides. It has a figure-hugging fit to emphasise the natural curvature of the body. Length (from waist to hem): 23in/58cm (24in/61cm in the larger sizes). It fastens at the rear with an attractive gold-coloured metal zip plus discrete popper stud. By Ashwood exclusively for the Tout Ensemble label. Please see our Product Description below for full details and important sizing information. NOTE: This same style with a kick pleat is available in other lengths - Midi: 27in and 31in; Maxi: 36in (click on links to see each one). (RRP £199.99) Perfect for smart wear, day or evening - a chic, beautifully tailored leather pencil skirt made in super soft lambskin nappa, sourced from British hides. It sits at the waist and tapers subtly in from hips down to the hem for a stylish, figure-hugging fit. Above the knee length that is an easy, elegant length to wear comfortably and without it being too revealing when sitting down. It fastens with an attractive 8in/20cm golden metal zip at the rear and is lined in a beautiful red satin fabric. Made exclusively for the Tout Ensemble label by Ashwood to our own design Please see our Product Description below for full details and important sizing information. NOTE: This same style is available in other lengths - Extra Short Mini: 12in;; Standard Mini: 15in (click on the links to see each one). (RRP £249.99). A very elegant high class leather pencil skirt, exquisitely tailored in finest quality, luxuriously soft and smooth lambskin nappa. It is styled to give a close shapely fit and elegant line. It is a below-knee or midi length (approx. 26in/66cm from waist to hem) and features a 12in fine hidden zip at the back which you can leave closed or open to form a vent. By Ashwood. Available in black, dark brown and deep burgundy (Note: the brown and burgundy are very deep/dark shades.) Please see our Product Description below for full details and important sizing information. (RRP £239.99). Beautifully tailored, smart and elegant leather pencil skirt made in fine quality, luxury soft and smooth lambskin nappa leather. Approximately knee length (23in) It is snug-fitting, sits at the waist and tapers in towards the hem for a shapely fit. The short split in the back seam gives added style. Fully lined. By Ashwood. Available in black or dark brown. Please see our Product Description below for full details and important sizing information. (RRP £299.99). A luxury item at a fantastic price! This is a most beautiful, classy striped leather pencil skirt made in dove grey finest nappa leather that feels exceptionally light, soft and smooth to the touch. It has a fine silver foil print stripe pattern that also gives it a 'fun' look for more casual wear. Styled for a comfortable fit, it sits just below the waist and is above knee length (19in length). It has side pockets and is fully lined. Please see our Product Description below for full details and important sizing information. (RRP £199.99). A superbly tailored, figure-hugging leather pencil skirt which features a full length back zip opening that you open from the hem upwards to be as revealing as you dare! 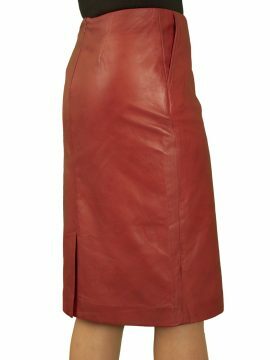 Made in finest quality, beautifully soft lambskin nappa leather, It is above-knee length (19in) and styled to be a figure-hugging yet comfortable fit. Fully lined. Made exclusively for Tout Ensemble. Available in 5 colours: black, beige cream, burgundy, navy and red. Also available as a 15in mini skirt (see here). Please see our Product Description below for full details and important sizing information. (RRP £279.99). So elegant - this suede leather pencil skirt in finest quality, sumptuously soft pale tan suede is perfect for smart wear. It is a below knee midi length (26in from the waist) and has a fine hidden zip in the back seam that you can open for added style and also extra room for movement. Fully lined. By Ashwood. Please see our Product Description below for full details and important sizing information.